Washington, DC (October 2008) – With the weather cooling down across the country, home heating and energy bills are top-of-mind for millions of homeowners. And despite inevitable fluctuations in fuel prices, there is one thing that remains a constant: the superior heat and efficiency of propane. The Propane Education & Research Council (PERC) offers consumers simple steps to help control their energy bills during cooler weather and year-round. Ninety-eight percent of American homeowners believe it is important that their home be as energy efficient as possible, according to a 2008 survey conducted by PERC. Fortunately, propane offers consumers more efficient energy with fewer emissions than other energy sources. In fact, propane furnaces can reach a peak efficiency of more than 95 percent, compared with 85 percent for home fuel oil. And, as far as green house gas emissions, propane and natural gas emit less carbon dioxide than any other fossil fuels. Additionally, technological innovations are advancing the performance of this efficient fuel. 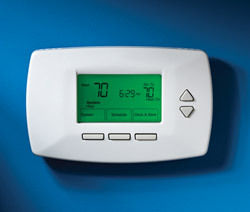 Tankless water heaters, for example, can reduce wasted standby energy by up to 20 percent. And ultra-efficient gas heating equipment can be used in a variety of heating applications—for example, in forced air and in-floor systems. For the millions of American households that depend on propane as their primary heating fuel, participating in simple energy planning can keep energy costs in check. Discuss fuel payment plan options with your propane retailer. Many retailers have budget payment plans that will help spread your projected annual cost of propane over many months—which helps lower the cost of seasonally higher bills, such as during the cold winter months. Arrange a regular propane delivery schedule with your propane supplier. Propane delivery throughout the year helps offset higher season pricing. Explore government tax credits and state rebates for high-efficiency home improvements. The federal government has extended many of the Energy Efficiency Tax Incentives for qualifying home improvements. This includes an extension of the tax credit for high-efficiency heating and cooling equipment, such as propane water heaters and furnaces (covering improvements installed in 2009, but not 2008). For more information on these tax credits, visit www.energytaxincentives.org. Many state propane associations offer additional rebates of up to $500 for installing energy-efficient propane water heaters and furnaces. Visit www.usepropane.com to see if your state offers such an incentive. Propane offers consumers more efficient energy with fewer emissions than other energy sources. Propane furnaces can reach a peak efficiency of more than 95 percent, compared with 85 percent for home fuel oil. As far as greenhouse gases, propane and natural gas emit less carbon dioxide per BTU than any other fossil fuels. Technological innovations are advancing the performance of this already efficient fuel. Tankless water heaters can reduce wasted energy by up to 20 percent. Ultraefficient gas heating equipment can be used in an array of heating applications, such as forced air and in-floor systems. Discuss fuel payment plan options for your local propane retailer. Many retailers offer budget payment plans which allow consumers to spread their projected annual cost of propane over the year. Doing so helps lower the cost of seasonally higher bills (for example, during the cold winter months). Work with your propane supplier to set up a regular propane delivery schedule. Propane delivery throughout the year helps offset higher season pricing.